"FREE FERRY: The state's ferry from Ocracoke Island to Hatteras Island would remain free thanks to an amendment approved by the House Appropriations Committee. The House budget proposal had directed the Board of Transportation to begin tolling the four ferry routes that currently don't charge a fee. Amendment sponsor Rep. Tim Spear, D-Washington, said Ocracoke residents depend on the ferry since they have no other way to get off the island and shouldn't be charged to leave for the mainland." So far, so good. If anything changes, we'll be sure to let our readers know. These last couple of weeks have seen islanders powerwashing boats, painting porches and steps, weeding gardens, and generally doing spring cleaning. After a long and cold winter it just plain feels good to be outside making life more beautiful and getting ready to enjoy the warmer weather. Earlier in the week I removed all of the furniture (including my hammock) from my screened porch, and powerwashed the deck, posts, screen frames, and back wall of the house. Everything had been coated with dust, mildew, and cedar pollen. Now, after lunch or in the late afternoon, I get to kick back in the hammock with a cool drink, feel the breeze, and read a good book or magazine. Life, as they say, is good on Ocracoke! Have you ever wanted to learn to sail? If so, you can now fulfill that wish while spending time on Ocracoke Island. Capt. Rob Temple, who has been sailing for more than half a century (many of our readers have enjoyed sunset cruises aboard his schooners, Windfall & Windfall II), now has a 24' Rainbow sloop and certification from the American Sailing Association. The Rainbow, Rob explains, combines simplicity, safety, and comfort to make it one of the most popular teaching vessels worldwide. To learn more about Ocracoke's new Windfall Sailing School click here. A couple of days ago I happened to run into the CenturyLink phone guy at Eduardo's Taco stand. I asked him if he knew anything about AT&T cell phone service on Ocracoke. He didn't know for sure, but thought their installation was complete, so as far as he knew AT&T phones ought to work on the island. Later that same day I spoke with someone else who said he had heard that AT&T cell phone service was still not up and running. Since no islanders have AT&T contracts, no one I speak with has any up-to-date information. Maybe one of our readers who has been on the island in the last week or so can shed some light on this. Our latest Ocracoke Newsletter is a history of the Ocracoke Preservation Society. You can read it here: http://www.villagecraftsmen.comnews042111.htm. You just never know what you're going to find on the beach. Easter Sunday afternoon Lida, Bill, & I took a stroll just south of the campground. Lida was hoping to find some seashells; I was happy just to be outside on such a glorious day. Down the beach we spotted a large green object at the high tide line. At first I thought it was someone fiddling with a kite or a beach umbrella, but it soon became apparent that it was not moving. As we came closer I realized it was a buoy. We joked that we might roll it back home and use it as a lawn ornament. "I wish I had my camera with me," I blurted out. "Don't you have your cell phone?" Bill asked. I'm guessing this is the Hatteras Inlet buoy that came loose when last Saturday night's severe weather passed by. 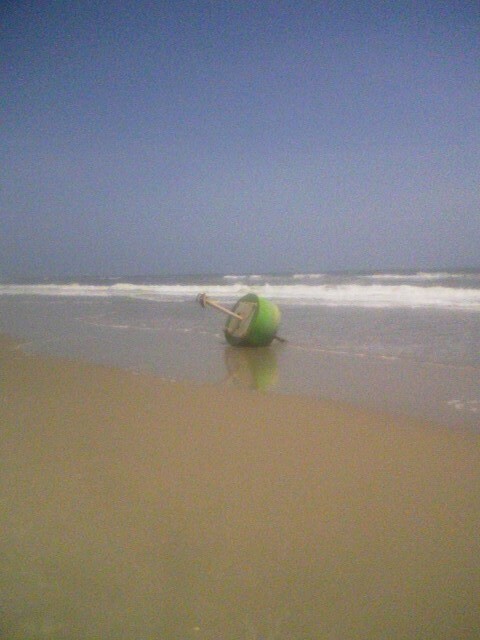 I suppose the Coast Guard will eventually retrieve it. In the meanwhile, I think it's safe right where it is. Yesterday I passed by Lydia Frieda's house. I love walking or biking down point in the late afternoon as the weather warms up because there is almost always a porch full of family and friends sitting on Lydia Frieda's pizer. Without even thinking about it, they are keeping a great old southern tradition alive. The gathering is typically multi-generational...grandmother, grown children, grandchildren...plus other family and neighbors. I often stop to chat over the fence, just to enjoy the scene -- children playing in the yard, adults laughing and sharing stories. Lydia Frieda's is the yellow house on the corner near Albert Styron's store. As you pass by this summer, wave and call out a "howdy." Happy Easter to all of our readers, from all of us at Village Craftsmen! In February a small group of Ocracoke Island residents gathered to explore the possibility of building a traditional wooden sailing vessel, perhaps a schooner or a skipjack. What may have seemed like an overly ambitious project at first, soon took on a life of its own, with an eastern North Carolina boat builder committed to overseeing the endeavor, and volunteers eager to help. If the funds can be raised, as expected, and other details worked out, the project could be started within the year. You can read more at the new (and still under construction) web site, http://www.schoonerparagon.org/. Last fall, when I pulled my wooden skiff out of the water for the season, I banged up the bow below the water line. It took three of us to position the boat onto the trailer, with constant gusts of wind and waves hammering us relentlessly. A storm was brewing and I didn't want to risk leaving the boat at the dock. In the process I also tore off the forward section of a 3/4" X 1 1/4" wooden strip that was nailed to the bottom of the skiff. Capt. Rob explained that this is called a worm shoe. According to an on-line source, a worm shoe is "a non-structural piece of wood, fixed to the underside of a wooden boat." It is designed to protect the bottom of the boat from worms and collisions with underwater objects in shallow water. It is also the part of the boat that comes in contact with the rollers on the trailer. The worm shoe is made to be easily removed. It took a couple of hours to raise the bow of the boat off the trailer, remove the worm shoe, cut a new piece of wood, and fasten it with stainless steel screws. Next I'll repair the bow with epoxy, then scrape and paint the boat. If all goes well I'll have her in the water sometime in May. Well, we've done it again. We've published our latest Ocracoke Newsletter. This month's article is a history of the Ocracoke Preservation Society. As I mentioned several posts ago, OPS has struggled financially recently due to rising costs and expenses, and declining revenues. It seems that the economic downturn has affected OPS, like it has so many other non-profit organizations. In an attempt to generate needed funds, a number of events have been planned (a recent Donald Davis storytelling evening, yesterday's auction on the museum lawn, and a Molasses Creek concert next month). This month's Newsletter is my contribution to these efforts. It documents the early history of the Society, lists a number of its accomplishments, and highlights some of its present and on-going projects. Ocracoke Preservation Society is a valuable and important repository of island documents, photographs, artifacts, stories, and information, as well as a public reminder of the value of historic preservation. You can make a donation to help support OPS by clicking here. You can read my history of OPS by clicking here. 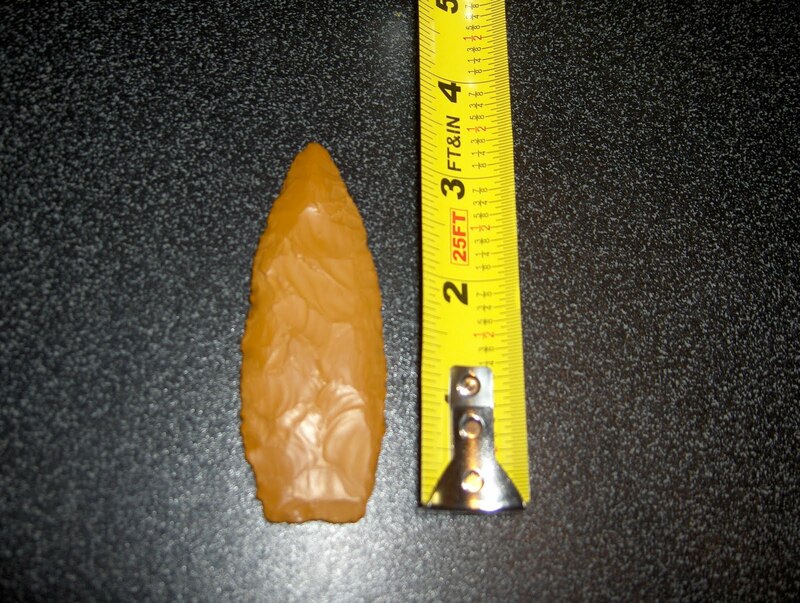 I think I may have shared this photo with our readers once before, but yesterday's post about the Native American pipe bowl I found on Ocracoke reminded me that a friend found a beautiful spear point on the beach just a few years ago. As many of you know, William Howard was the first European owner of Ocracoke Island to make his home here. Previous owners used the island only for grazing livestock. I am often asked, "Who did William Howard buy the island from?" And I always answer this way: "He bought it from Richard Sanderson, who inherited it from his father, Richard Sanderson, who bought it from John Lovick, who got Ocracoke as a gift from the Lords Proprietors, who were granted the island by the King of England...who stole it from the Native Americans." Perhaps one day we will understand and appreciate the native people who lived, hunted, and gathered seafood on our island. When I attended the genealogical society meeting in Avon (on Hatteras Island) last week, I had an opportunity to speak with Andy Powell (see Saturday's post) about his excavations on Hatteras. One of his discoveries was that Native Americans had been living on, or frequenting, the Outer Banks for about 9,000 years. In his reply he said this American Indian pipe bowl is similar to others that were found on Hatteras, and they are believed to have been used for ceremonial or "medicinal" purposes. Andy is interested in doing some archaeological digs on Ocracoke on a future visit to the states. If you live on the island, or own property here, and would be interested in having an expert conduct small auger tests please let me know and I will pass this information along. Over the past few weeks I've mentioned several Ocracoke Island words and expressions dealing with illness. You may remember "collamaugus" and "collabogus." Then there was "quamished to the gut. "In the past I have commented on "doasted" (as in "I'm doasted right") which comes from the word "dose" (as in "I've got a dose of the flu"). Here are a few more island expressions dealing with being sick: "You've caught that cough what killed Kermit's dog." "She's got the Patsy Lab." "Everyone down point's got the zeezes." If you ever hear any of these comments you know there's an Ococker nearby! Mark your calendar for this Wednesday, April 20. At 5 oclock p.m. the Ocracoke Preservation Society will be conducting a live auction on the museum grounds. There will be furniture, art, and antiques offered to the highest bidder. Many of the 30 or so items were donated to the Society for fundraising purposes. Of course, none of the Society's permanent collection will be auctioned. 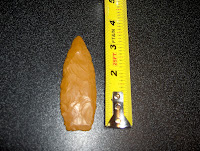 However, most items have connections to Ocracoke history and heritage. You can preview the items at 4:3o pm. Come on out. Take home an island treasure and help support OPS. Earlier this year I donated a cast iron wood stove to the Hatteras Island Genealogical and Preservation Society. Actually, I was returning the cook stove to Hatteras. It was given to me years ago by Guy Quidley, a Hatteras Island native. When Dawn & Angel came to Ocracoke to pick up the stove they invited me to their April 12 potluck dinner and meeting in Avon. I decided to attend...and am glad I did. It was a fascinating evening with information about the Lost Colony of Roanoke Island, and attempts to trace the ancestry of Hatteras Islanders to the 1587 colonists and the Croatan Indians. In case you are not familiar with the story of the Lost Colony, when John White returned to Roanoke Island in 1590 the colonists were gone, but White discoverd the word "Croatoan" carved on a tree. Croatoan is the name of the island that, at that time, included a small section of the north end of Ocracoke, and the southern section of Hatteras Island, including the Buxton village area. (The present day Hatteras Inlet did not open until 1846.) Unfortunately, due to a storm, White was unable to search for the colonists, and his ships returned to England. The first speaker of the evening was Roberta Estes of the Lost Colony Research Group, who presented information about using DNA to trace Hatteras Islanders' roots to the Lost Colony. Next, Andy Powell, former Mayor of Bideford, England, the home town of Sir Richard Grenville (Grenville led Sir Walter Raleigh's expeditions to North America), spoke on the Lost Colony. Powell is the author of a new book, Grenville and the Lost Colony of Roanoke, which has been described as "a very fresh perspetive on Sir Walter Raleigh's Virginian enterprises," and as "an important new addition to the library of 'Lost Colony' research." Melinda, one of the owners of Tradewinds Tackle Shop, sent me an email a few days ago with three photos and this message: "A customer found this jaw bone with teeth and brought it in the shop to ask what it could be.The teeth are the size of my thumbs. Any ideas?" If you are an expect re. such things (or know someone who is) we would love to know what animal this fossil came from. Please leave a comment. We Must Kill Toni, A Family Murder Comedy by Ian Stuart Black -- That's the title of the latest production by the Ocracoke Theater Company under the direction of Charles Temple, our high school English teacher. The show stars Joseph Chestnut, Maddie Payne, Virginia Downes, Emmet Temple, and Andrew Tillett. The opening performance is tonight at 7 o'clock at the Community Center. There will also be performances Friday & Saturday evening at 7, and a Sunday matinee at 1 p.m. If you are on the island be sure to come out for an evening's entertainment. Tickets are $6. I'm taking a day off today! I've been off the island (just to Avon) twice in the last two days (more about that soon), and I've got a lot of personal stuff to catch up on...and I'm tired. Look for a post tomorrow. A recent post elicited yet another comment/question: "You mention the almost-impossible-to-imagine broad tidal flat that extended from the Variety Store to the NPS campground. What caused that geographic feature to disappear from the island?" First, a photo from 1957. This picture was actually taken at the north end of the island...but it will give you a good idea of what Ocracoke looked like on the Plains, the area between the NPS campground and the Variety Store. A little history is in order. No one is certain what Ocracoke looked like two hundred years ago, although the area where the village is was different from the "sandy banks." The village, with its live oaks, cedars, and other trees, was probably built on what was at one time a separate "inside island." Whatever vegetation grew on the sandy banks was eventually eliminated by livestock (horses, cows, goats, & sheep) that grazed on the island. When the Park Service acquired Ocracoke they began construction of man-made dunes on the ocean side. This protected the new paved road from tidal overwash. Today lush vegetation, including myrtles, yaupons, and cedars, covers the Plains, what was at one time a wide tidal flat. Here is the final question posed by one of our readers: "Without the prevalence of amenities like air conditioning or insect repellant, what did you least look forward to [on trips to Ocracoke in the 1950s]?" Mosquitoes were definitely a problem sixty years ago. I remember occasionally walking around the village after dark, and having a dark cloud of mosquitoes constantly attack us. During dry summers we weren't bothered much at all. There was no effective community mosquito control program back then, and we didn't have insect repellant (not that it would have done any good...there were so many of the critters), so we simply cut myrtle bushes with our pocket knives and used them to swish away the bugs. If you stopped swinging the branch you'd be covered! When my father built our new house (the one Amy, David, & Lachlan live in) in the mid-1950s, he installed an indoor bathroom. I can't say I missed my grandparents' privy. Until the mid-1970s all drinking water on the island came from rainwater collected in wooden, brick, or concrete cisterns. It always tasted the best...although it was a tad disconcerting to have to strain out the wigglers (mosquito larvae) with cheesecloth. We never did get them all. Cleaning the cistern in the spring was never the most pleasant task either, but it was interesting to see how many tree frogs were living in the tank. Livestock continued to roam freely over the island until the mid-1950s. Even though there weren't many cows, I did step in a fresh cow pie one evening. Of course, I was barefooted. That was not the most pleasant experience! Living without air conditioning never bothered me. In fact, remembering my grandmother's lace curtains gently moving in the summer breeze conjures up even more vivid memories of those wonderful lazy July and August days. Today I address the fourth question from one of our recent comments: "What did you look forward to most [when coming to Ocracoke as a young boy]?" The answer to that question is easy -- Freedom...and Adventure. Coming across Pamlico Sound on the mailboat Aleta, or across Hatteras Inlet on Frazier Peele's ferry was like being transported through a gateway into a land of magic. Island life was so different from the rest of the world. The first thing I did when I got to the island was take off my shoes and socks...and I didn't put them on again until the end of the summer. I roamed around the village with friends, went fishing with Uncle Enoch in his skiff, gigged flounders in the sound, explored Springer's Point, had opportunities to ride Uncle Marvin's horse, attended Saturday night square dances, swam in Silver Lake, learned to eat clams, climbed on remnants of long-ago shipwrecks, watched the pony round-up on the Fourth of July, climbed the lighthouse, and body-surfed in the Atlantic. A young boy on Ocracoke in the 1950s could wander all day long and most of the evening without a chance of getting into too much trouble. We were carefree, and island life was full, exotic, and wonderful. Our latest Ocracoke Newsletter is a list of traditional island remedies. You can read it heres: http://www.villagecraftsmen.com/news032111.htm. Dale works at the Post Office, and is a source of some great island stories, many that he heard from his grandmamma Ollie and other older ladies "down point." Following is a funny story about Dale, as told by one of his former school teachers. Enjoy! One day when Dale was in high school he was working on a shop class project, but ran out of glue. In those days his teacher simply sent Dale down to the Community Store to buy some epoxy. After gluing his work, he became nauseated from breathing the fumes. Dale left the shop classroom and wandered into the main building. As he was passing the main office, Dale decided to make his concerns known to the school's brand new principal. Dale burst into the principal's office, threw his hands down on the desk, and looked Ben Utley square in the eye. "Dey Blessed Father," he blurted out, "I'm dee-sgusted some. That damned ole ee-poxy's got me right quamished to the gut!" With that Dale turned and walked away, leaving Ben scratching his head and wondering what he'd gotten himself into. Early Wednesday afternoon I was walking along the beach, enjoying the sun and the breeze. I had walked about a mile and a half when, suddenly for no particular reason, I decided to turn around and look behind me. Out of the corner of my eye I noticed a large area of disturbed water out near the horizon. Immediately I realized it was too big to have been caused by a pelican diving for fish. The whale sounded, then in short order the flukes reappeared. 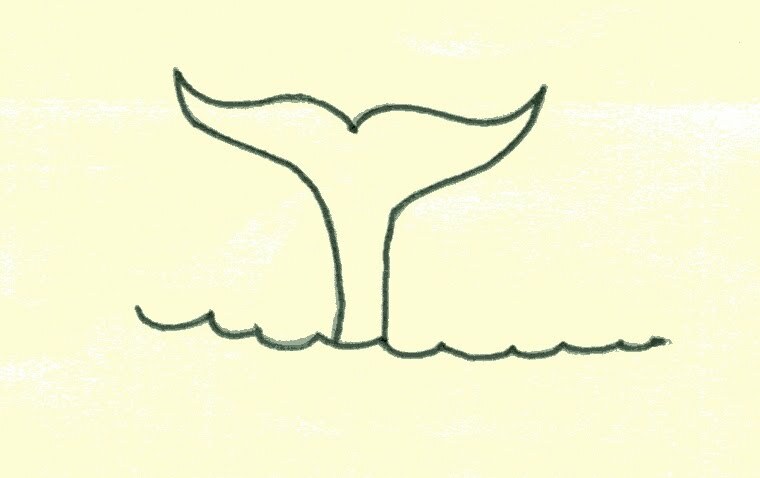 This was repeated about a dozen times...then the whale disappeared. The next time you are out walking along the beach be sure to keep your eyes open for these majestic creatures. I've heard of more whale sightings in the last few months than ever before. In case you haven't heard, Charles Temple, one of our Ocracoke School teachers, will be competing on the TV quiz show Jeopardy early next month. Charles teaches high school English, and is something of a polymath, so none of us were surprised when he made the cut. Charles will be competing in a tournament for teachers which lasts two weeks. The shows were taped at the end of March, but Charles is sworn to secrecy about the outcomes. As you can imagine, the Ocracoke community is looking forward to seeing Charles go head to head with teachers from other parts of the country. The tournament begins Monday, May 2. Charles appears on Thursday, May 5. Be sure to mark you calendars. Our latest Ocracoke Newsletter is a list of traditional remedies. You can read it here: http://www.villagecraftsmen.com/news032111.htm. Our third reader question from several days ago is "How was the village different from the way it is today?" Actually I've addressed this in some of my answers to the previous questions. Before I was six years old the mailboat (or a private boat) was the only way to get to Ocracoke. There were no ferries...and no paved roads (except, as I mentioned, the concrete road the Navy built in 1942). After WWII Ocracokers brought Army surplus Jeeps and Dodge Power Wagons to the island. They, at least, could negotiate the sandy roads. In those days virtually everyone living on Ocracoke was related in one way or another...often in several ways. There were a number of double first cousins. There were a few hotels and restaurants (the Island Inn & Coffee Shop, Wahab Village Hotel [now Blackbeard's Lodge]...and by the 1960s, the Harborside Motel, and the Pony Island Motel & Restaurant...plus several tourist homes that had catered to hunters and fishermen for years). Old Jake Alligood and his wife Myra ran a hangout with a jukebox for teenagers (ice cream, snow cones, candy, soft drinks, etc.) where Sunflower Studio is today. We teenagers seldom wore shoes. I was always impressed when an islander stomped out a cigarette with his bare foot. Few of the boys wore shoes to school...and during hunting season they would simply prop their weapons up against the classroom wall. After the roads were paved Ocracoke got a deputy sheriff. The boys put a pebble behind deputy Archie Wahab's hubcap so they would know when he was approaching. The "bald beach" extended right up to where the Variety Store is located today. From there to where the NPS campground is now there was nothing but a wide tidal flat from ocean to sound...with an occasional dune here and there. This area is call "the Plains." Hundreds of terns and other birds nested on the bald beach. There was also much less vegetation in the village. I remember sitting in the sandy lane in front of the house I now live in, with a pad of drawing paper on my easel. I drew a pen and ink sketch of the newly built Berkeley Castle (now the Castle B&B). Today I can't see past my neighbor's trees and garage. Visiting neighbors and relatives was an important part of island social life. There was no TV or air conditioning, so we visited. The major social event of the day was greeting the mailboat when it pulled up to the dock in the late afternoon. It seemed like the entire village would turn out to see who was on the boat...and, of course, to get their mail. This may be difficult to imagine, but there was a movie theater on the island in the 1950s. It was in the ground floor of the Wahab Village Hotel (Blackbeard's Lodge). Ocracoke is different in 2011...but still a great place to live. A reader asked recently if we will be starting our Ghost Walks soon. Ghost and History walks will resume April 19. They are offered Tuesdays and Fridays at 7:30 pm. and last approximately one and a half hours. They cover about one and a half miles in the village. We meet on the porch of Village Craftsmen on Howard Street, across from the Howard family graveyards. Cost is $12...$6 for children (6-12 years old). For more information please go to http://www.villagecraftsmen.com/ghostwalk.htm or call 252-298-6300 to make a reservation. Walking along the beach lately I've noticed more than the usual number of "Devil's Pocketbooks." These black, tough pouches (about 2" long) with "horns" at each corner are actually skate egg cases. I don't know why they are more common at some times than others. I suppose it has to do with the skates' life cycle and gestation period. This is the second question from one of our recent comments: "How did you arrive when visiting?" 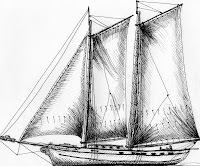 I mentioned the mailboat Aleta when responding to Question #1. Eventually the Aleta's owners, George O'Neal and Elmo Fulcher, lost the contract for carrying mail to Ocracoke, and Ansley O'Neal contiued the service with his boat, the Dolphin, for several years. By 1950, however, Frazier Peele began car ferry service across Hatteras Inlet. His first ferry was nothing more than a skiff with planks nailed across the top for a deck. Later he built a four car boat with railings and a ramp. 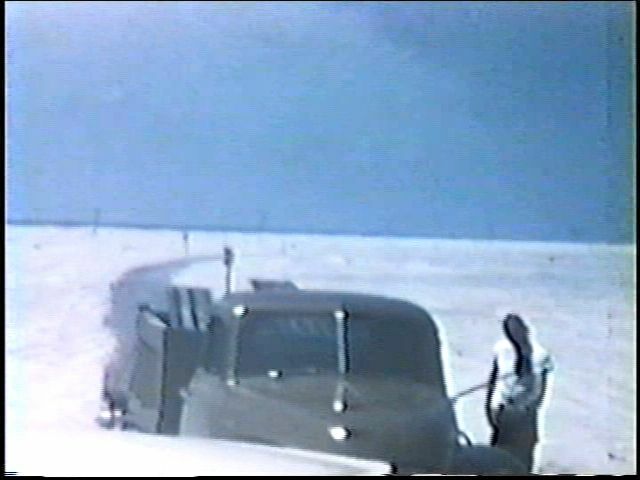 We brought our 1948 Plymouth across on Frazier's ferries until the state of North Carolina took over the operation in 1957, the year the paved road was built the length of the island. Prior to that time, Frazier would simply let you off on the beach, and you'd have to drive the 14 miles along the surf, hoping not to get stuck in the sand. If you did get stuck you could only hope the Coast Guard would find you before the tide did! Did I mention that travel to Ocracoke was quite an adventure before the 1960s? One evening last week when I was visiting Blanche she commented on an old island expression: "Don't eat that [usually unripe fruit]. You'll get the collamaugus." The next day I stopped in the Post Office to see if Dale knew the expression (Blanche thought he would, but I was doubtful [Dale is only in his 40s]....Blanche, as usual, was right.). That got Dale started. "Younguns," he said, "we say that Down Point all the time when you're sick to the stomach. But we pronounce it collabogus." Later in the day I was buying a few groceries at the Variety Store when Lisa walked in. She stopped to talk with Trudy, then came over to me. "What is that word again you and Dale were talking about?" "Collamaugus," I said. Trudy looked perplexed. She'd not heard that word. Lisa turned to me. "Didn't Dale pronounce it differently?" she said. Trudy's eyes lit up. Of course she knew "collabogus." That's the word Pointers use! Creekers speak a different language. They say "collamaugus." In case you're not familiar with Ocracoke village geography, Down Point is the section of the village from the Island Inn down toward the lighthouse, and including the Castle B&B, etc. Around Creek is that part of the village on the other side of Highway 12, including Howard Street, School Road, the British Cemetery, etc. There's not simply a distinctive Ocracoke brogue...there is a Down Point brogue, and an Around Creek brogue! Both words, collamaugus and collabogus, are corruptions of Cholera Morbus, a term used in the nineteenth century for what we today would call gastroenteritis...upset stomach with diarrhea and vomiting. Our latest Ocracoke Newsletter is a list of traditional island remedies. You can read them here: http://www.villagecraftsmen.com/news032111.htm. Just the other day a neighbor told me that orcas had been sighted just off shore. I was skeptical. I had never heard of orcas in our waters. "Oh, yes, it's true. Some people have pictures. Fishermen at Hatteras even posted a video on YouTube," I was told. Ocracokers were shocked yesterday to learn about the National Park Service's newly released plans for the Ocracoke lighthouse. It seems that a researcher for the NPS was perusing original documents in the Library of Congress when he stumbled upon an 1823 directive, adopted by Congress, and signed into law by James Monroe, 5th President of the United States. The directive specifies the light beam patterns and the "day marker" colors for each lighthouse along the Atlantic coast. Ocracoke is listed as "steady beam...red and white, alternating horizontal bands." Now, after nearly two hundred years, the Park Service has made plans to repaint the Ocracoke lighthouse red and white. The news spread like wildfire through the village. Most residents were outraged and ready to fight the federal bureaucracy, although a few felt that the 1823 directive should be honored. In a matter of hours the Ocracoke Civic and Business Association issued an official statement, and drafted an online survey to gather opinions about the new colors. Be sure to make your voice heard. Take the survey by clicking here. We'll keep you updated as this story unfolds.